What's the Difference between On-page and Off-page SEO? Blog » SEO » What’s the Difference between On-page and Off-page SEO? Do you know that there’s a big difference in the on-page and off-page SEO? In this post, I am going to talk about the difference between on page and off page SEO, and how you can improve your website ranking using the best on page and off page SEO practices. SEO is a process of optimizing websites, so people, as well as search engines, can easily read and understand it. There are different ways to create and optimize the already published content, images, videos and the website. When it comes to search engine optimization, Google and other search engines don’t disclose ranking factors which their crawler use to rank a website. The reason is, they don’t want people to manipulate their search results. SEO doesn’t happen in a short amount of time. It is a continuous process of optimizing and improving the website to bring more audience through organic search. You have to wait, improve your website, generate new content and do the content promotion. After that, it is possible to have a good amount of organic search traffic on your website. Improving organic search traffic can be done if you deliver the best content in your industry and become a thought leader. The process of SEO (Search Engine Optimization) can be categorized into 2 big segments; on-page and off-page SEO. Let’s first understand what do we mean when we talk about both of these terms. Any activity to improve and influence website’s ranking through performing different actions on the website. These actions can be termed as on-page SEO. There are variety of onpage SEO techniques that can improve the ranking of any website. Off-page SEO is any activity done outside of your website. This includes content promotion, social sharing, link building, guest posting, etc… There are a variety of off-page SEO techniques which can be used to improve the ranking of a website. 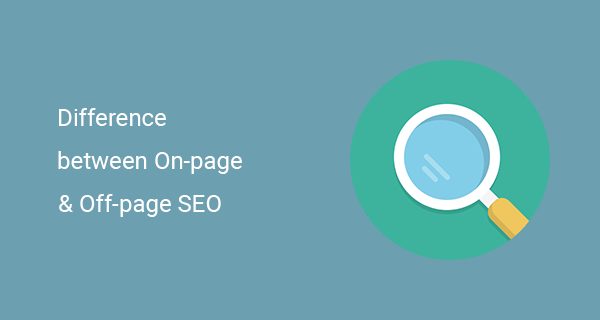 What’s the difference between onpage and offpage SEO? When we talk about both of these terms they are totally opposite to one another. However, they should work together in order to achieve a better organic ranking of your website. In my opinion, you should use a good combination of both to get the best results. I hope you find this post useful. Let me know your thoughts in the comments below. Do you need help with SEO? Please check out my on page SEO services and get a quote.